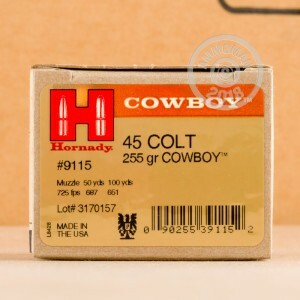 Cowboy action shooters will appreciate the low recoil and clean ignition of these .45 Colt cartridges from Hornady. 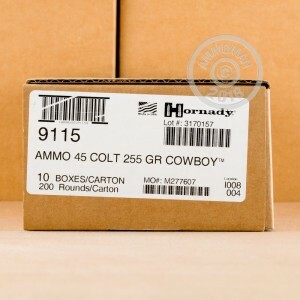 These rounds come in boxes of 20 and fire a 255 grain lead bullet designed to flatten upon contact with steel targets. 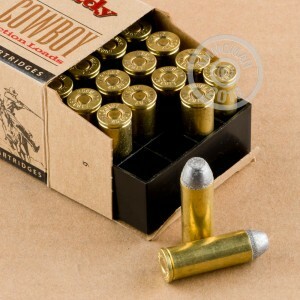 This ammunition uses a relatively mild powder charge to produce a low muzzle velocity of 725 feet per second. Reduced recoil enables the shooter to make faster, more accurate shots for better scores. Stock up for your next match with free shipping on all orders over $99 at AmmoMan.com!